Home » News » Friday, Oct. 26 at 5PM is the Deadline to Request an Absentee Ballot! You can still request an absentee ballot to vote in the Nov. 6 Election — but the deadline to submit a request to your County Clerk is tomorrow, Friday, Oct. 26, at 5PM. 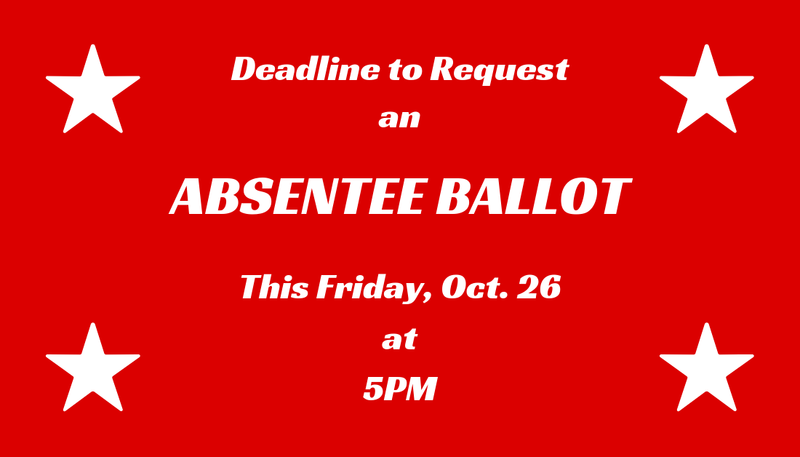 Deliver your completed & signed Absentee Ballot Request Form to your County Clerk by 5 PM Friday, Oct. 26. You can fill out and print the form by clicking here. If you don’t have a printer, go to your County Clerk’s office and fill out an Absentee Ballot Request Form there. You may also simply write a legible note requesting a ballot for the Nov 6, 2018 election. In that note you must also state your name, county of residence, address which you are registered at, where you want your ballot mailed and you must personally sign your letter, and deliver it to your County Clerk by Friday, Oct. 6 at 5 PM. Also, you can fill out your completed & signed Absentee Ballot Request Form, scan it, and email your signed & scanned form to your County Clerk. This link has all the contact info for all Idaho County Clerks. Please note: Merely sending an email with a note requesting an absentee ballot is not sufficient. Whether hand-delivered or scanned, your request must include your signature! If you have any questions, please contact us at info@idgop.org or (208) 343-6405. And remember, if you miss the Absentee Ballot Request deadline, you can still vote! Contact your County Clerk about Early Voting in your county — Early Voting goes until Nov. 2. Or, you can vote at your polling place on Election Day, Tuesday Nov. 6. If you don’t know your polling place, click here to find it. Also, if you’re not yet registered to vote, Idaho allows for same-day voter registration for Early Voting and on Election Day, as long as you have proper ID. Contact your County Clerk for details. You can also find additional info about voting from the Idaho Secretary of State here.